Well...turned 37 the other day, one year closer to 40. Wife and kids were fantastic as always, Hallmark can rot in hades in comparison to the fantastic cards Danielle and Ashley made for me on my birthday. They are beautiful kids and I'm so blessed to have the family that I do. Jen surprised the crap out of me with a 60G iPod Video for my birthday....I've been playing with it for days and love the little thing. Loaded it up with songs and podcasts that i can now listen too...very happy to finally hear what Sean and the gang have been doing over at Lord Admiral Card Club. Will have to schedule some time in Cincy to meet up with them sometime. Poker has been pretty slow as of late....I've sworn off UB for the time being and I'm messing around with a free $20 that All-in poker gave me for answering some survey questions. Been playing .25/.50 NL and have built the $20 into about $70 over the past few days, so very happy about that. If I get the bankroll to $100, I'll probably try and play through their SnG Rounders series and make some real cash...the first level is $5, so that would be no real stress on the bankroll. I'll probably go back to UB sometime in Feb and try to build the bankroll there again as well. I'm still in a bit of shell shock over loosing pretty much my entire roll earlier this month...puts the WSOP and the summer WPBT event in jeopardy, not to mention the eye surgery is light years away again. Finally, we're looking at houses again....we're headed out tonight to revist a house we saw on Sunday to look again and get a good feel for this house in particular....take some photos and such as well. We're excited about what we remember about the house...2 acres, swimming pool, 4 bedrooms, etc....nice country setting and good schools...and the price seems right, so we may even put an offer on the house tonight or at least by the end of the week if all goes well. Will be easy if we hit the lotto tonight, but just in case, this house will do nicely for the next 20 years or so. Anyway...time to get some work done....ttfn. What can I say but.....WOW!!!! 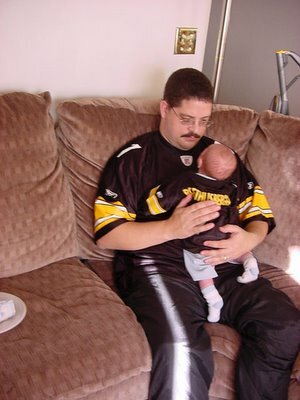 My beloved Steelers are going to Super Bowl XL to face the stinking birds from Seattle. While I firmly believe that the Steelers will win the game, I do hope for an enjoyable Super Bowl....plenty of Iron City will be flowing on Feb 5th. Thouroughly enjoyed watching Jake implode yesterday....have never liked him since his college days, so was enjoyable watching him throw the ball to the Steelers all afternoon. Congrats to The Bus for making it to the big game. A ring will be the fitting end to a HoF career, not to mention one of the classiest guys in the NFL finally getting his dues. I apologize for the lack of updates in the past week...spent last week in LA on business...didn't make it to the Bike or Commerce :-( for any poker. Instead played in the hotel room and proceeded to drop the majority of my bankroll at the $10/20 tables, as my positive run has finally crashed this month. My bankroll has shrunk to $500 in the course of three short weeks. I pulled the cash off of UB last Tuesday when I hit another down session and have been reduced to playing $1 SnG on UB fo rthe past week. Has been nice playing NL after focusing on limit games for the past 6 months...have posted a profit over about 10 SnGs....up about $8 total after cashing in 7 of the 10 tourneys. I'm going to sit back and avoid the cash games for awhile and nurse my bruised and battered ego back to health....read some books and dig through my PT stats to see if I've gone off the deep end somehow these last few weeks. Then start over again with $500 and start building the bankroll again. Such is the life of a poker player. WAY TO GO STEELERS....most gut wrenching final 5 minutes I've ever seen. So glad that Bettis' fumble didn't cost them the game, as that would have been a terrible way for him to retire. Now a game against the Broncos and hopefully the Super Bowl in a few weeks. Poker has been brutal this month...bankroll has taken a serious hit over the past couple of weeks. Need to regroup this week with some reading and get my head back on straight about playing...have found myself getting sucked into loose wild tables where I end up seeing almost any flop if I have anything reasonable....my PT stats are wild and I shoudl know better. A few days away from the computer and travelling to CA should help get me focused again. May try and hit the Bicycle or Commerce for some live play, but chances are pretty slim, as there is a pretty large group of co-workers on the trip, so will most likely have to stick with the group. Next update will be from sunny (hopefully) CA....ttfn. Cincy gets a visit from New England, Carolina and San Diego....as well as traveling to KC, Denver, Indy & TB....the benefits of winning the division....good luck going 11-5 again next season without some improvements to the defense. In poker news...had another meltdown on Sat morning at the $10/20 tables....was down $459 (my self-imposed limit to leave a $10/20 table is $500) and was waiting out the blinds when I get dealt KK UTG....hell...I have to play this, so I raise it up and get 4 callers (pot $85)....flop comes 9-7-2 rainbow and I look golden. I bet and get 2 callers ($115). J on the turn completes the rainbow board and I lead out again and get a reraise from late position...I put him on AJ or QJ base don his earlier plays. I reraise and they both call ($295). A vicious A hits the river and I cringe inwardly, as my gut tells me one of these guys stuck around with an A....I check, middle player check, late position bets, I call, mid position reraises, both call and watch these two 'poker' players flip over A3os and A8os....They both called an early position, pre-flop raise with weak aces and then chased them to the river to catch their 2 outer and bust my kings. No idea what the dude was doing reraising me when that J hit the board with a weak A.....simply amazing to watch these guys/gals/kids sling money around with little to no regard for how to play the game at all. So this final hand cost me another $110 and I leave the table down $570 or so. Came back an hour later and tried my luck again...had AA cracked in the first orbit by a suited 37 that ran down runner, runner for the flush on a flop of A, 10, 9...why he called my bet on the flop is beyond me...but I figured that the poker gods were trying to tell me something so I left the table minus another $100 for a final hit in the junk of about $700. Was able to recoup some of the loss ($390) on Sunday morning by returning some of the bad beats to other players. Cracked a pair of Aces when his A on the turn (giving him a set) also filled my straight from the BB with Q-10os. He was less than pleased....but he slow played the pocket rockets and paid the price. Hoping to make up the rest of the weekend loss while travelling this week, as I hope to be able to get in some hands from the hotel room while travelling this week. I tend to play pretty well while travelling, as there are fewer distraction while on the road. And Iggy and I did settle on a wager for the game...looking forward to the additional cash in my bankroll due to the Steelers yesterday....thanks Iggy. http://2006.bloggies.com/ - Vote for Tao of Poker (see link on right side). Just so it doesn't appear that I win all the time...reporting that I dropped $400 last night at $10/20 on UB...was up quickly about $110, then gave it away to a loose player when my small pocket pair didn't improve on a ragged flop and he caught a Q on the river to after calling my bets on the flop and turn for a decent pot. Played pretty normally for me...nothing paid off...when I had a strong hand pre-flop, everyone folded to my pre-flop raise....when I had a drawing hand pre-flop, 7 people limped into the pot and I missed almost every time. There was a ton of money to be made at the table, I just couldn't catch anything to get some of it....at least 4 calling stations that would call down any hand if they saw the flop, regardless of what they had...was pretty sad to not take their money and leave the table down $400. Plan on getting it back this weekend. BTW....Iggy finally agreed to a bet on the Steelers-Bungals game this weekend....$50 and he wanted a point, so that's the bet. He said no way to wearing a Steelers jersey at the next WPBT event.....chicken. Not much else...back to work...ttfn. I'm sitting in a pretty posh room at the Sheraton in St. Louis, MO for a vendor audit tomorrow morning and get the chance to play some online poker while listening to the Penn State/FSU game (Go Penn State...gotta root for the Big 10...and I HATE FSU...that damn tomahawk chant is like fingernails on a chalkboard in my head...Penn State up 14-13 starting the second half). Anyway...played about 60 hands of $10/20 tonight...nice profit of $331 for my efforts....while I'm happy about the results, just finished with a call from home and it seems like Alan is not feeling well...been sick a few times today (which is unlike him...he's shown an iron stomach so far) but not showing any fever...he's scheduled for a 1 month check-up tomorrow, so I'm sure they'll give him a good looking over and make sure he's ok. First time he's sick and I'm stuck here in MO....feeling pretty helpless about the whole thing...wish I was home helping Jen with the girls and Alan. Thanks to April for taking the lead on the next Blogger get together...looks like the leading candidate is the weekend of July 9 out in Vegas....not sure if that will work for me or not...was hoping to make one of the $1000 buy-in events and they're not on that weekend...so will have to see how the bankroll builds over the upcoming months. Almost to the surgery level now...just need to build past that so I can get the surgery done and still have a bankroll left to play on post surgery, not to mention WSOP cash. Here's hoping for many, many more profitable sessions. BTW....looks like Iggy and I are in the process of wagering on the Steelers-Bungals game this weekend....any suggestions on a wager from the bloggers....I'm leaning toward the looser having to buy a team jersey for the winning team and wearing it at the next blogger event....but cash may enter the picture. Since my Steelers are favored in the game, I'm letting Iggy set the stakes....LMK if any of you have any ideas. 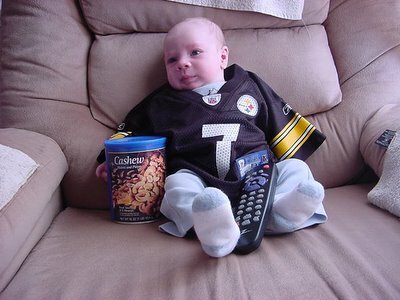 All ready for the game with his new Big Ben Jersey. Explaining to Alan the finer points of pass interferience against the Lions during the game. We look pretty snazzy in our matching 'Big Ben' Jerseys. 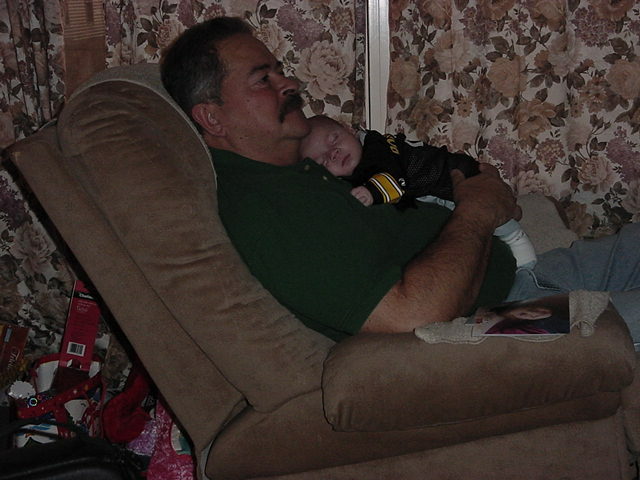 Grandpa & Alan after cheering the Steeler's to victory and a play-off spot. Gotta rest up for the Bungals next week.